The Book of Ra series of games from Novomatic are by far their most popular slot games! The central character of the games, the architect, will be a familiar face to many Novomatic players. 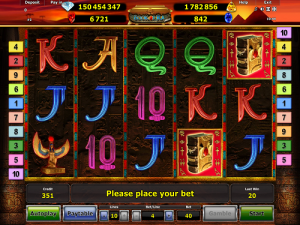 He features on the reels of this slot game, along with all of the other familiar symbols that are seen in this series of games. The soundtrack to this particular version of Book of Ra is Novomatic all over! Some of the sounds that you hear are unique to this slot or the Book of Ra games as a whole. This slot, the Book of Ra Deluxe Jackpot Edition, has 4 different jackpots. The best thing about this jackpot version of Book of Ra is not that there are four of them, but that the jackpots are all progressive! The payout percentage in theory (RTP) is 95%. This isn’t very high for a Novomatic slot game and many of the modern slot games from other developers also have higher RTPs – some of up to 98%. This means that overall, this game doesn’t pay out as much as other slot games but you can get some big wins! Especially during the Free Spins and if you get the jackpot. Other jackpot slot games from Novomatic include: Golden Sevens, Golden Sevens Deluxe, Jolly Fruits, Amazing Stars, Age of Privateers, Monkey’s Millions, Power Joker and Jackpot Diamonds. Egyptian-style card values are at the lower end of the paytable. They have the lowest payouts of all the symbols and have payouts for x3, x4 and x5 matches. The Book of Ra symbol also only pays from x3 matches but this is a special symbol! This is the Scatter symbol and so it can pay from any position on the reels, as long as there are enough matches! The scarab beetle is also on the reels, and the golden statue of Isis. Ra’s golden sarcophagus can also be found on the reels, as well as the familiar and friendly face of the architect! He is the highest paying symbol on the reels, like he is in all of the slot games from this series. The architect and the ancient Egyptian-themed symbols (the scarab beetle, the Isis statue, the sarcophagus) pay much more than the playing card symbols. They also have an additional payout compared with the other symbols and that’s the x2 payout. All payouts are only given when symbols that match up land in winning positions! As is rather normal for a Novomatic game, the paylines pay from left to right. There are 10 paylines in total, which can be activated or deactivated to suit your preferences. Consecutive matches, from the leftmost reel towards the rightmost reel, on a payline, will give the payout appropriate to the symbol and the bet that you’ve chosen! As we already mentioned, the symbol that shows the infamous Book of Ra is a Scatter symbol. You get a payout when three or more land on the reels, wherever they land! The Book of Ra symbol is also able to act as any other symbol. It can fill in gaps in other winning combinations to get you that payout. In this way, it acts as the Wild symbol. Wilds and Scatters are very common in slot games, especially Novomatic casino slot games. Also, when you get a payout from x3 or x4 or x5 Book of Ra symbols, the bonus spins will start! You are given 10 at a time and every time three (or more) land in a spin, you get 10 more! Before these begin, one symbol is chosen at random, by flicking through the pages of the Book of Ra, to be the special expanding symbol. This symbol, when it lands in a position where it can pay out, will expand to cover the entire reel! During the normal game, at any time and on any symbol, a golden coin may appear! There could be one or two in any one spin. These golden coins will be put into the treasure chest sitting atop the reels. Whenever this gets full, it will shake and explode and take you to the jackpot game! The jackpot game is a 3x4 grid with the symbols covered. You have to uncover the symbols one by one to reveal the jackpot that you’ve won! Three blue sapphires pay out the mini jackpot. The red rubies pay out the minor jackpot. Three yellow diamonds pay out the major jackpots. Three colourless diamonds (the most perfect and valuable of them all) pay out the grand jackpot. This grand jackpot can reach hundreds of thousands!